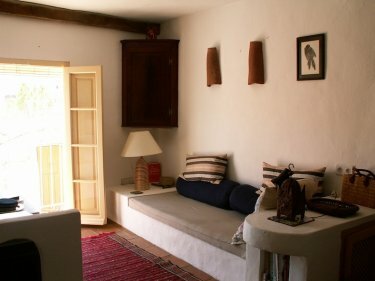 Ceramicist Sue Binns and her architect husband Henry have created a pair of delightful houses in the heart of Gaucin, arguably the loveliest of all the white villages. The houses are side by side in a quiet pedestrian alley and are ideal for use separately, or together for an extended family or group, up to six people. 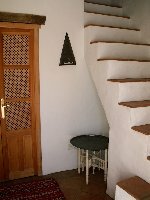 La Ceramista 1 sleeps 2 and La Ceramista 2 sleeps 4. Both are comfortable and well appointed. 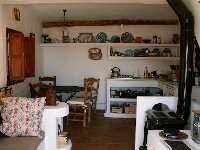 We think that La Ceramista 1 has just about everything that two people need for a week�s wonderful holiday in Andalucia. It has comfy beds, nice linen, good pots and pans, the essential Braun juicer and a wonderful view. 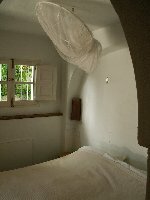 The downstairs bedroom is shady enough to stay tolerably cool in the summer nights and the top terrace is partly covered for best of both worlds. 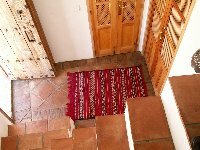 The house is situated on a quiet pedestrian alley and you will seldom be disturbed. It has three floors. 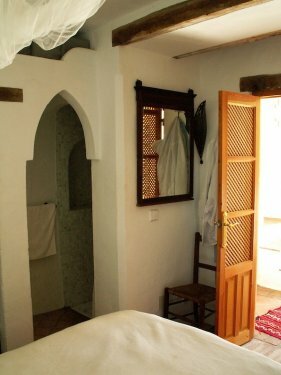 On the ground floor there is bedroom with two single beds, which can be joined together or not, as you choose, an en suite shower and a separate loo and basin. On the first floor there is a kitchen, living, dining area. The kitchen area is simple and has a sink, gas hob and fridge, but no oven. There are some nice ceramics from Granada, as well as from Sue's studio. The living area has a built in banquette and french windows with a little balcony. The wood burning stove keeps the house more than cosy in the winter and there are additional electric heaters in the bedroom and bathroom downstairs. The top floor is all terrace, half outside, with great views and half inside, with comfy cushions on the lounger. 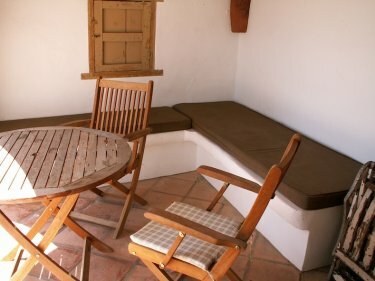 There is also terrace furniture and a barbecue. 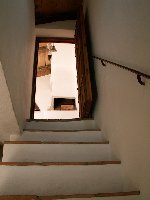 The stairs are steep and not fully guarded and the surfaces are universally hard. 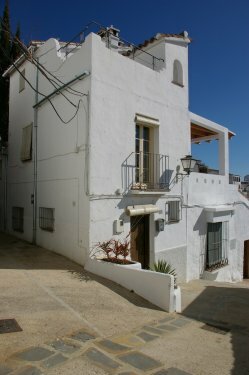 The house is not therefore really suitable for young children or for those with limited mobility. If you want to rent the house for more than one week, or if you want to rent both houses together, we can offer a discount. Please contact us for details. Our price includes bottled gas for water heating and cooking and normal, responsible use of electricity. In the winter we provide a bag of wood and a bag of kindling, which should be sufficient for three or four nights. After this we ask you to obtain your own wood from a local source, contact details of which we can provide.